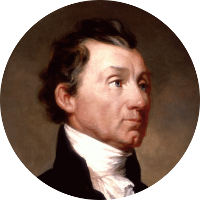 James Monroe was the 5th U.S. President and the last of the Presidents who were considered Revolutionary War heroes. James Monroe was with General George Washington when he made his famous crossing of the Delaware River in order to attack the Hessian soldiers garrisoned at Trenton. Monroe was shot and wounded in the ensuing battle and spent 3 months recovering from his wounds. However, President Monroe is most famous for his Monroe Doctrine in 1823. It was a policy informing European powers that North and South America were no longer open to European colonization and any attempt by European powers to do so would be considered as an act of aggression towards the United States. In return, the United States would not interfere in European internal affairs. The ancestry of President James Monroe is relatively unknown compared to those for other U.S. Presidents. President Monroe believed his ancestry to be associated with the Clan Munro of Foulis in Scotland, however sources have yet to be found making that connection.